My quiet time is the early morning. I get up at 3:30 am to have 2-1/2 hours of quiet, uninterrupted time to catch up with the national and local news and the stock market. I read my emails, respond to product information requests, and write my daily blog. Easy, right? Not today. Today my DH couldn't sleep. He has been revising and revising this letter that he's faxing to the Jury Commissioner to explain why he should be recused from jury duty. Revised and revised and revised. Now, as someone who write and edits and revises, I understand the concept of changes. But this is starting to get extreme. So, by the time I left the house in disgust at 5:15 this morning, he had already been in the room six, yes SIX times to revise and edit and revise again. It's not as though he engaged me in conversation, but he interrupted my flow of thought. My entire day is on edge now because of this crap! It's going to take a while to regather my balance, if indeed I can regain it at all. My teeth are on edge, my temper is frayed, and I am as far from a nice low blood pressure as I can think of. He's sure that I was dismissing him for every reason except the one that is the fact - that he interrupted my thoughts enough that it drove me crazy. I give up! Current Location: At work...more than an hour early! 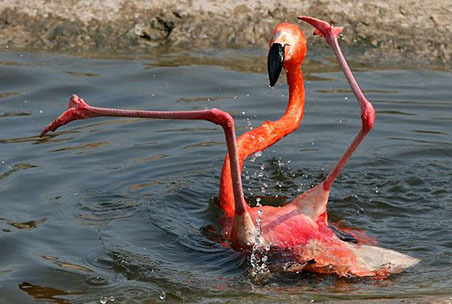 I thought that Flamingo was the funniest thing I had seen in a long time - LOL. It's been an on-edge day for sure.